You have only one day in Barcelona city and you need a tidy, quick and well planned schedule for your holiday. Here in this article you can find how to be a local in Barcelona city? How to act as a local in Barcelona is easy with this post. You will spend just one day but make the best of it with suggestions below. I hope you will enjoy the guide. If you have only one day and would like to live like as a local in Barcelona then you should hurry up and wake up early! For early risers there is a small but great place called Xurerria Trebol. When you order a coffee please don't forget to ask for churro I mean the best churro in Barcelona city. Local people in Barcelona start their day in Xurerria Trebol located at Corsega, Gracia district. 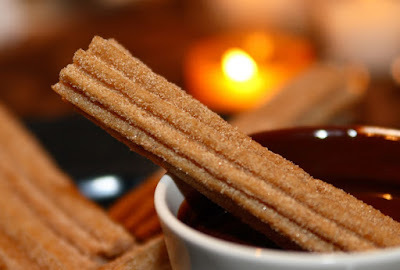 It's possible to find churros with any kind of filling such as chocolate, creamy caramel sauce or frankfurter churro. Beside churros you can find crisps, croquettes or pork crackling at Xurerria Trebol. The place is open all night. After your breakfast, you can drop by Kowasa photography bookstore in Mallorca street, Barcelona. You will feel like in the paradise among more than 10.000 books of art. It's a photography bookshop which is online where you can find lots of books in different categories such as fashion, vintage, men or women. Kowasa bookstore is one of the biggest ones in Barcelona city. After getting lost in the book paradise, you can head to Els Encants bazaar. This market is the largest and best known as flea market in Barcelona. You may want to go there except Saturday as on that day it's really busy and if you want a good bargain you should arrive in early in the morning. So you can go there before Kowasa bookstore if you are interested to buy something. You can find lots of vintage stuff and if you are eager to buy antique pieces then you need to be sure that it's Monday, Wednesday or Friday and please remember that vendors are generally about to pack up at noon so you need to hurry. You must be hungry now so stop at Bar La Plata for tapas and have a rest for a while. So being a local requires to know the best local tapas restaurant in Barcelona city. As you are full and relaxed now you can buy extraordinary souvenir for your lovings or yourself also:) You know when we visit a new city, magnets come to our mind for souvenir but if you love Espadrille (casual, flat and high heeled shoes originating in Pyrenees) in Spanish style then you can stop in La Manual Alpargatera. They are handmade shoes with many different colors and patterns. La Manual Alpargatera is a way to shop as local in Barcelona city. The owners are warm and welcoming people. You will enjoy while shopping there. After shopping craziness, you may want to have sometinhg to eat so yes if you are in Barcelona for one day then you must become satisfied with tapas. We highly recommend a good tapas restaurant Quimet Quimet . There are lots of options you can try. After dinner if you would like to spend the night with football then you can drop by Bar Leo in Barcelona. By the way if you say Quimet Quimet is a little far away from the city you can have tapas at Bar Leo also. There are table soccer and the Tv is on air for only football matches. Barcelona city travel tips for our adventurous travelers; it's the general rule that before 11.00 pm there is no alive music places except for Heliogabal. You can listen to alive music at Heliogabal at 7.30 pm if you prefer. That's an example day to spend Barcelona city trip for one day as a local. You can check our other articles if you prefer alternatives. Have a nice day in Barcelona. We hope your Barcelona Travel will be great.